Anthony Meier Fine Arts is pleased to present an exhibition of new works by Rosana Castrillo Diaz. In her third solo show at the gallery, Castrillo Diaz debuts a series of three-dimensional wall works that continue parallel dialogues with light and shadow, visibility, surface and materials. Castrillo Diaz's oeuvre resides in the periphery of perception. The question of the reality, the thereness, of a piece creates a slower look, a more focused visual experience. Engaging textiles including cotton book binding cloth and silk handkerchiefs to create dense textured surfaces, Castrillo Diaz varies her subtle result from pillowy and cloud-like to regimented structure through a similar, refined practice. 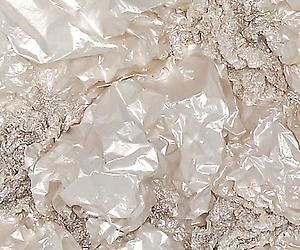 Tissue and rice paper constructions covered in mica paint - a crystalline mineral that pearlizes to create a multicolored effect - and a cube sculpture of mica are also on view. Maintaining a uniform hue throughout, the nuance of color shifts as light moves in and around the reflective surfaces. Achieving simple, quiet beauty through a complex yet understated process is a cornerstone of Castrillo Diaz's work. The depth and integrity of her work is belied by its ephemeral and ethereal presentation. Castrillo Diaz was a recipient of the 2004 SFMOMA SECA award. She has created site-specific commissions at SFMOMA and UCSF Mission Bay. Her work is included in the collections of the Whitney Museum of American Art, Berkeley Art Museum and MIlls College Art Museum.